Prom season has wound down for the high school hordes, but for one local group of spirited souls who’ve been to hell and back, the party’s just gearing up. 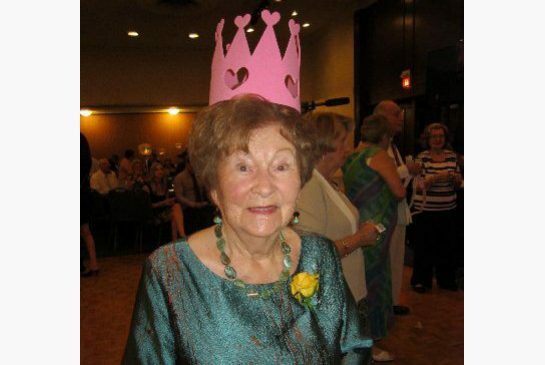 Excitement is mounting for approximately 400 of Toronto’s Holocaust survivors this week, as they plan their wardrobes and practice their dance steps for the 4th annual Senior Prom, to be held at the Sephardic Kehilla Centre, organized by The Yellow Rose Project. It’s all the brainchild of Elise Kayfetz, a passionate 28-year-old gerontologist who understands that looking forward to an event has the power to increase longevity. She also realizes that there’s a precious, dwindling community in our midst whose youth was nipped in the bud: Most survivors never had a chance to indulge in the joys of youth—the socializing, the party dressing, the music, the fun. “What I wanted to do was give them back something they never had, an experience they never even dreamed of having,” explains Kayfetz. And so, with the help of some generous sponsors, Kayfetz went about master-minding a grand soiree to put some spring back into the steps of these inspiring survivors, and allow them to indulge in the simple pleasures that regular “prom-goers” might take for granted. Attendees are treated to transportation, make-up application, a 3-course meal, live entertainment, a prom photo and even corsages. Just as a yellow Star of David was the symbol that would designate Jews during the time of the Nazi regime, yellow roses have become the prom’s symbols for celebration and new beginnings. “It’s a great night off for these survivors,” says Kayfetz, “a night to meet old friends, and even make new ones.” Most rewarding for Kayfetz was witnessing a special, lasting friendship develop between one elderly survivor and a young adult volunteer who met at one of the proms. And while their amazing survival stories have become such an integral part of who these survivors are, this isn’t meant to be a night rife with tales of woe. Not at all. “I wanted to give them the opportunity to just dance, a night where they don’t have to get up at the podium and tell their story,” Kayfetz says. “It’s so beautiful to see them all dancing—such a serious juxtaposition. When many of these people were 16, they were in hiding, or in concentration camps. Their relatives were shot in front of them. This is a night for them to feel free, a night when hopefully, they won’t have nightmares,” she says. Kayfetz, whose thesis focused on the impact of the Holocaust on survivors, and how to best care for them, understands the torment of the post traumatic stress disorder many still suffer from. But unlike those of us who are the actual children of survivors, and have grown up in the shadow of this horrifying historical episode, Kayfetz’s family wasn’t directly affected. “My grandparents came here before the war,” she told me. “Maybe that’s why I have more clarity to be able to do this. It feels like a moral obligation, but a joyful one. My real job is to celebrate these people. They’ve been through so much to get here, I want to do what I can to make them happy.” 24-year-old Shayla Schipper, chair of sponsorship for the prom, also appreciates the intergenerational aspect of the event, “It’s an evening in which the young volunteers can show gratitude for the strength and courage of an older generation,” she notes.